UPDATE: A heavy downpour didn’t stop dozens of protestors from marching through the streets of Capitol Hill Thursday to encourage neighborhood fast food workers to walk off the job for better pay and the right to organize. Although none appeared to have walked out, earlier in the day there were reports of workers leaving their jobs at Jimmy John’s, Wendy’s, McDonald’s, Subway, and other chain restaurants around the city. The protest lasted for about an hour, backing up some traffic as strikers and organizers marched from Plymouth Pillars Park, up Pike, then up Broadway. The march was peaceful and there was no reported property damage or police presence. 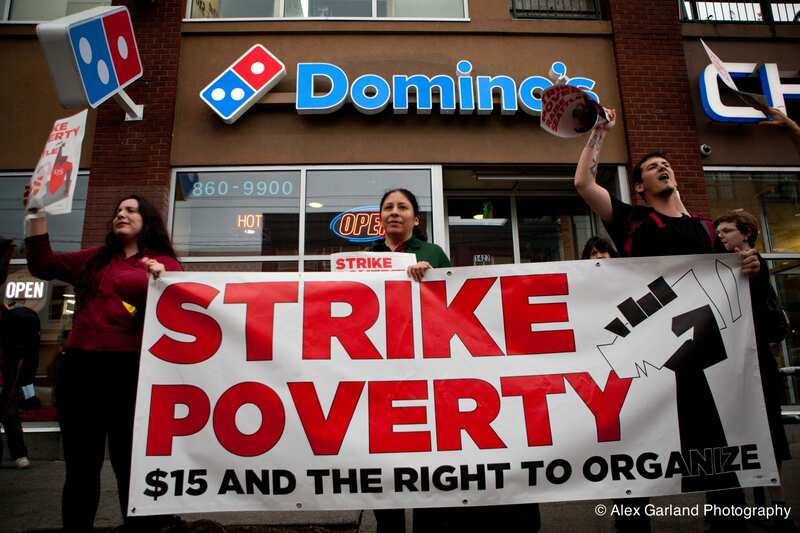 The Capitol Hill march was part of a nationwide day of striking among fast food workers. 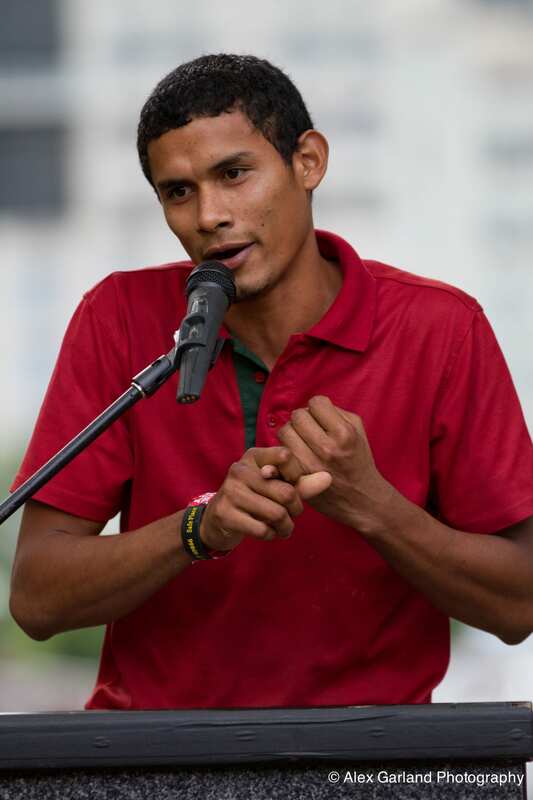 Carlos Hernandez, 21, walked off his job at the Broadway Subway earlier in the day. Donning his Subway uniform, Hernandez marched in the afternoon rally and urged his coworker to walk out when the protest reached the Broadway Subway. At the Panera Bread on Broadway protestors pleaded with Cecilia Durbin and others to leave their jobs and join the march. The march started with a scheduled 4 PM rally at the Plymouth Pillars Park at Pike and Boren. More 100 people gathered there, including striking fast food workers, union organizers, and a handful of politicians (including Mayor Mike McGinn). Protestors came from as far away as Portland and Tacoma. 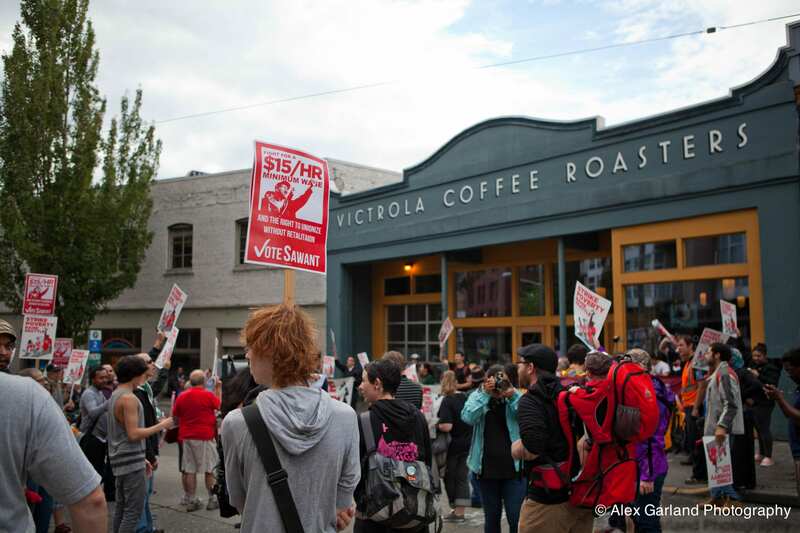 Among the chief rallying cries was for Seattle to institute a $15 minimum wage. Increasing the minimum wage is the cornerstone issue in Kshama Sawant’s campaign to unseat city councilman Richard Conlin in this year’s election. Sawant spoke at the rally and joined the march. Benjamin Roberts, 24, was the only barista working at Victrola when the protestors entered the Pike St. coffee shop to ask him to walk out. 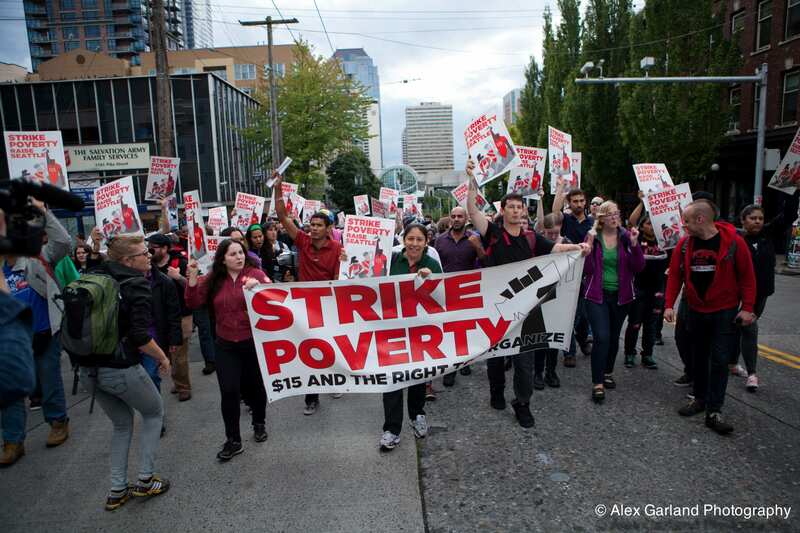 First report: Seattle fast food workers joined others nationwide in walking off their jobs this rainy morning to fight for better wages and the right to organize. Many of the scheduled walkouts were concentrated downtown. Most Capitol Hill chain restaurants and coffee shops appeared to be operating as usual this morning, including the Broadway Subway and Qdoba that was the site of large protests in May. Organizers plan to hold a 4 PM rally today at the Plymouth Pillars Park at Pike and Boren. Sage Wilson of Good Jobs Seattle tells CHS those gathered will fan out from the park for more protests at nearby fast food locations. Stay tuned for more. While no walk outs were reported on the Hill, strike organizers say two employees walked out of the First Hill Jimmy John’s on Madison this morning. Seattle Police were called to the new Starbucks at Pike and Broadway earlier this morning because there were reports of three people “yelling, throwing around coffee.” CHS found no commotion or signs of strikers a short time later. On Tuesday The Stranger reported on a downtown Starbuck’s barista that had been fired because he ate an uneaten sandwich that was thrown away.The walkouts appear to be targeted at chain restaurants and not the independent and local food/drink establishments around the Hill. While some of the walkouts and protests were scheduled, including a 7 AM rally in Westlake Park, a handful of other walkouts appear to be more spontaneous as organizers make their rounds throughout the city today. Follow #829strike and #strikepoverty if you want to stay abreast of the action. There’s a labor movement of a different type also underway on the Hill tonight. A “community meeting” for drivers and passengers is being held at Boylston Ave E’s Fred Wildlife Refuge starting at 5:30 PM. Alternatives to traditional taxis and town car services have come under pressure as the Seattle City Council looks at increased regulation in the space. The Seattle Weekly says Thursday night’s gathering is a pre-rally of sorts before the issues comes before the Council again on Tuesday. 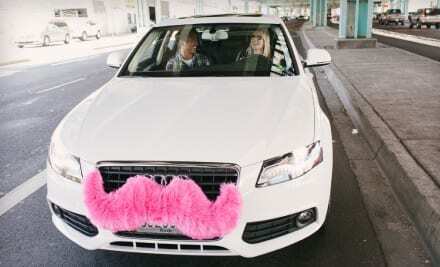 Lyft, which bills itself as “peer-to-peer transportation,” allows freelance-style drivers to sign up to provide rides to passengers in exchange for donations calculated by the Lyft app. I think that Qdoba closed a few months ago. It’s vacant now. No? Good on everyone who walked out of their jobs and who participated in the protest to demand a living wage! You are brave souls and all of you are to be commended for putting what income you currently have on the line (especially in the current economy) in an attempt to make the pay and benefits better for yourselves and future workers. We must continue to write our legislators, attend council meetings, and march in the streets until everyone is paid a fair wage w/benefits in order to strengthen the economy and finally give some financial security and peace of mind to all workers. Ridiculous. Rather than going to school, improving themselves, and working hard to advance their career choices – instead they whine about not making enough, and expect the government to bail them out. I made minimum wage at one point in my life, but I took responsibility for my future. I didn’t make minimum wage for very long. Instead of spending wasted time for something so ridiculous it will never happen, why not devote that energy to advancing their lives? Free handouts are easier, that’s why. The thing is, in order for society to function, SOMEONE has to work these jobs. I am not saying they should be paid like doctors, but why shouldn’t they make a living wage? Also, assuming that everyone has the same abilities and potential is just wrong. I am not saying that everyone does not have equal value in this world (I don’t think value is solely linked to intelligence and earning potential)…Good for you if you pulled yourself up by your bootstraps, but not everyone can do that. Who is asking for “free handouts”? If you’ve worked minimum wage, you should know that those jobs often involve lots of work and long hours. People just want to be able to afford to live in this ever increasingly expensive city. EXACTLY, Rachel! Very well put! That “someone” should be high school kids who live at home with their parents, or people who work two jobs, or people who need to suplement their family income. Or people who know they can no longer live in the city and therefore move to a more affordable place. Minimum wage should not mean livable wage. Teaching people that they can stay in a skill less, burger slinging job for their entire lives and support themselves is not a value to society. Motivating people into obtaining a work ethic is. Few entry level office workers even make $15 an hour. And, yes, I too, made $7.50 an hour when I took a burrito making job at 21-years old. Nothing motivated me more to get out of there than not even being able to afford Top Ramen. @sharon minimum wage should mean unlivable wage? I feel for folks stuck in minimum wage jobs. I had to work a few when I was younger. I’m friends with some who still do. On one hand I do not like the high turnover, low wage employment being practiced by many companies. On the other hand I don’t think it’s a good idea to give people incentive to stay in these jobs long term. It’s incentive to stay in a job that is fulfilling for most. Ultimately I think the US would benefit from raising the federal minimum wage. We can raise it to a livable wage but only over several years. This will have a huge effect on prices. We won’t get this for free, but it would raise the general standard of living. I agree with Jeff. If you don’t like what you are being paid, no matter what your job is, get more training/education and get a better job. It’s that simple, folks. A reminder: The minimum wage in Washington is the highest in the nation. I have a Bachelors Degree and 15 years experience in the child care field. Sadly I make less than $15 an hour. I work very hard every day and give my all to young children. Going to school to better yourself is not really the answer in many cases, it is having a society that values what people do and give to the society. Give people a living wage and realize how unfair our current wage is for many fields. I don’t know what your wage is, but it’s probably significantly more than minimum wage ($9/hr), so obviously your BA degree helps. And you must have known approximately what your wage would be when you went into the child care field, so it seems a little weird for you to now be complaining about what you earn. Well it is also very expensive to live in WA. Have you compared the price of living here to other states? Food, housing etc… is quite a bit more here. I’ve heard the WA state is expensive compared to everywhere else thing a few times before, and I don’t get it. I’m sure it’s expensive compared to some places, but having moved here from NY and having been born and raised in the northeast, the cost of living, lack of state tax, and housing prices here are a dream come true. Thank you, BW, for your insight. There are many other areas of the USA where the cost of living is more than in Seattle….one that comes to mind is San Francisco, where the mean housing prices are approximately twice what they are here. Seattle is not an inexpensive place to live, but then what quality/in-demand places are? Just because you’re paranoid, don’t mean their not after you. Good for these workers! Glad to see them standing up for themselves and ORGANIZING to demand better wages and better working conditions. They are joining a long and storied history of working people taking collective action to demand their fair share of the profits made on their backs, from their sweat and labor. If it wasn’t for labor organizing itself – as UNIONS – we’d all be working 7 days a week, sunrise to sunset, with no benefits and for peanuts on the hour. And then we’d be criticized for not “lifting ourselves by our bootstraps” and “demanding handouts” by the hogs sitting on top of their piles. I am so tired of seeing comments on this issue that imply that all people working minimum wage jobs are lazy and uneducated with no goals. Do you know how many people with advanced degrees work as baristas and fast food workers? Lots of people have done everything right to get ahead but in this economy it’s often just not enough. Then if you’re older or a minority you’re even more likely to not be able to get a good job. It’s true that not everyone who works at these places has education, experience, or goals but a lot of people have all of that. As they say, “it’s the economy”. You may not realize this because education and work worked for you but it’s just not that easy for everyone and people need to stop blaming the victims here. Why isn’t anyone fighting for rent control or lower cost of living? Is it too late for that? Why does someone who holds a b.a. work as an office assistant and make only $13/hr, yet no one is fighting for them? They took the initiative to complete a degree and won’t be making as much as someone who didn’t finish school? And they probably have a lot of student loan debt. And don’t you think that the fast food business owners/corporations will choose to automate a lot of what they do? If you can buy cupcakes in a vending machine and sushi off a conveyor belt, or check your own groceries, won’t these jobs eventually be eliminated? Don’t get me wrong, I think everyone deserves a living wage, but I think we should also be looking about better rental conditions/costs of rent and living. As for getting a 15 cent raise in 8 years, that’s totally bs, the cost of sandwiches and burgers has gone up in 8 years, shouldn’t some of that be given to hard working employees? I agree, this is a mess, I just don’t have the answers. It’s not either/or. We should be fighting for both. I think that the point isn’t that fast food workers should make $15 while office workers make $13. It’s that everyone in Seattle should make at least $15.00 – and considering the costs of living in the Seattle is so high. It’s not unreasonable to ask employers pay a wage that will accommodate that. As for motivation … I’ve made $15 as soon as i got out of college and I currently make more than that. And trust me. More is better. I am extremely lazy… If I was motivated at $15 to find a better job – I’m pretty darn sure other people (non lazy normal people) will too. I don’t think that motivation is a logical reason to keep the min. wage low. Will they never learn? A binding minimum wage causes unemployment, especially long term. The very first thing that minimum wage workers need to know is that their opinion is not valuable (which is why their wages are so low). They are learning from President Harry S. Truman. He DOUBLE the minimum wage – in spit of fierce right-wing opposition – and it had absolutely no effect on unemployment. I’m all for minimum wage increases if they come with a tip credit attached. If you make more than 15/hr in tips? I don’t have to pay you. My servers average over $30/hr with tips, sometimes a lot more. And I have a hole in the wall. I’d love to pay my kitchen staff $15/hr, but as it is there is simply no money left in the kitty at the end of the day. When I started in the industry 25 years ago good line cooks made 10/hr when min was $3.85. Now that we have to pay everybody min wage regardless of tip income, guess what cooks make? About $10/r. If min goes to $15 we’ll survive, but prices across the board will go up and we’ll staff less hours to make up for the added labor costs.